Some people subtitle this movie as Indian Love; the reason is perfectly clear. 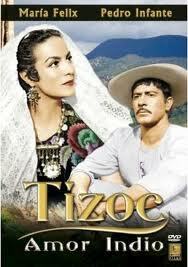 Tizoc (Pedro Infante) is an Indian who works hard while the rest of the indians envy and even hate him. One day he meets the most beautiful woman on earth, María (María Félix) so takes her as the Virgin of the local church. The woman is member of a wealthy country-family, one of the richest of the region. However, the wealthy, beautiful and Virgin-like woman befriends the poor but hard working Indian. One day Tizoc is hurt by another Indian. María witnesses this and gives him a white handkerchief to wipe his blood. ¡Alas! The man goes crazy. In fact she ignores that to offer a white handkerchief to an Indian of this region means to accept him as the husband. Now Tizoc works harder to build the house where he and María should come to live. No matter what, Tizoc won't listen to anybody, not even the local priest: he is convinced that María wants to be his wife. After a few days he comes to believe that María has made a fool of him. So, angry, he kidnaps her and takes her to a mountain. Even the Army comes after him to rescue the wealthy woman, but also the other indians who hate Tizoc. In captivity María talks to Tizoc and he realizes his misunderstanding. So he lets her go free. But then one of the other indians, trying to kill Tizoc, shoots her an arrow to kill her. The saddest Tizoc takes out the arrow from her breast and plunges it into his own chest. Moved, she begins to weep. Then, when he realizes that she's crying, with a rock hits the mouth that has made her cry.